Article on the lack of recognition for Sir Keith Park, entitled "A collective memory failure", published in the "Mrs Moneypenny" column of The Financial Times. Response by Terry Smith offering financial support for an appropriate memorial to Sir Keith In London published by The the Financial Times. Terry Smith visits New Zealand to meet Campaign supporters, members of the Park family and politicians. Meeting at City Hall, London, between Terry Smith, chairman of the SKPMC, The Hon. Phil Goff MP then Minister for Defence, NZ, and Boris Johnson, Mayor of London. Mr. Goff delivers to Boris Johnson a letter supporting the SKPMC signed by the leaders of New Zealand’s political parties. SKPMC Planning applications submitted to Westminster City Council for both the temporary and permanent statue of Sir Keith Park – thousands of members of the public write to Westminster City Council in support of the applications. Unveiling of the maquette Statue of Sir Keith Park at City Hall with 'Battle of Britain' veterans, Park family members, the High Commissioner for New Zealand, the High Commissioner for Malta and the Deputy Mayor of London. "Circuit of Britain" - Terry Smith recreated Sir Keith’s epic anti-clockwise circuit of Britain 90-years on. Westminster City Council Planning Committee approves the planning applications for a temporary statue of Sir Keith Park on the Fourth Plinth in Trafalgar Square and a permanent statue of Sir Keith Park in Waterloo Place. Terry Smith visits New Zealand to meet with Park family members and politicians and Campaign supporters. Unveiling of the temporary statue of Sir Keith Park on the Fourth Plinth, Trafalgar Square, London. Cross Party SKPMC Early Day Motion '651', in support of the permanent statue of Sir Keith Park in Waterloo Place, raised in the UK Parliament. Article welcoming the permanent statue of Sir Keith Park, entitled "At long last, a statue of the man who won the Battle of Britain", published in the "Mrs Moneypenny" column of The Financial Times. 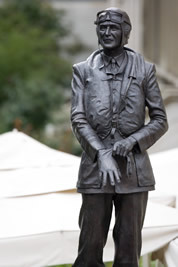 Permanent bronze statue of Sir Keith Park unveiled in Waterloo Place, London.